The Advertising Standards Authority has today given notice to Internet Service Providers (ISP) in the United Kingdom that, with effect from 23rd May 2018, they will expect all broadband ISPs to advertise “average” speeds (the median measured at peak time) for their headline packages. At present the existing guidance, which has been in place since 2012, requires that any headline broadband speed being promoted by an ISP must be achievable by at least 10% of their users (i.e. the fastest 10% of subscribers) and these figures should be preceded by an “up to” qualifier. On top of that the ISP must also explain any limitations that may affect the user’s speed. For example, a normal ADSL2+ based copper broadband line (these are still used by most UK premises) can theoretically deliver a maximum download speed of 20-24Mbps, but under the ASA’s current rule most of the major ISPs will instead advertise a download rate of “up to” around 17Mbps (i.e. this is what the fastest 10% receive). Separately Ofcom’s Code of Practice for Broadband Speed also requires ISPs to give consumers, at the point of sale, an accurate personal estimate of the maximum speed that their line can support; this usually comes in the form of an upper and lower performance range. Speeds that fall too far below this can enable customers to exit their contract without penalty. We should point out that these rules are separately being tightened (here). As a result of this the ASA claims that complaints about broadband speed(s) have fallen by 60% since the rules were introduced, but this year they’ve also come under growing pressure from politicians to act (here, here and here). The Government’s former Digital Economy Minister, Ed Vaizey MP, simply described the current approach as “misleading” and “ridiculous“. “Consumers have come to expect that ‘Up to 8Mbps’ often means rather less – but the fact is that regulations say that just 10 per cent of users have to be able to receive that speed for the advertising to be acceptable. It’s like walking into a supermarket and choosing the best apple only to have it exchanged at the checkout for the most shrivelled. The CAP also recommends that speed testing facilities, such as those provided on the ISP’s website, should be promoted in ads “wherever possible“. * Consumers may interpret a range as the speed they are likely to get individually, as opposed to the range that consumers generally are likely to get, and a range does not tell consumers where in the range they fall, if at all. A median speed, described as “average”, is easily understood and allows for consumers to make comparisons between different ads that they see. * As peak time is when traffic volumes are highest and traffic management policies are most likely to apply, a peak-time measure provides a better indication of the actual speeds consumers are likely to experience. CAP considers that a 24-hour measurement has the potential to mislead consumers by not providing an indication of the speed they are likely to receive at the time when people use the internet the most. At present Sky Broadband already does something similar and is one of the only ISPs to have been promoting an “average speed” across their packages since December 2016 (here). Sky’s ADSL2+ based service promotes an average download of 11Mbps (usually up to 17Mbps), while their FTTC based Sky Fibre promotes an average of 34Mbps (usually up to 38Mbps) and Sky Fibre Max promotes an average of 57Mbps (usually up to 76Mbps). “There are a lot of factors that affect the broadband speed a customer is going to get in their own home; from technology to geography, to how a household uses broadband. While we know these factors mean some people will get significantly slower speeds than others; when it comes to broadband ads, our new standards will give consumers a better understanding of the broadband speeds offered by different providers when deciding to switch providers. The change could be said to ignore the fact that many subscribers may still be able to achieve much faster performance than the advertised median, yet at the same time it also reflects that a lot of other users will still suffer even slower speeds. Ultimately the 50% rule was arguably the least contentious option on the table. 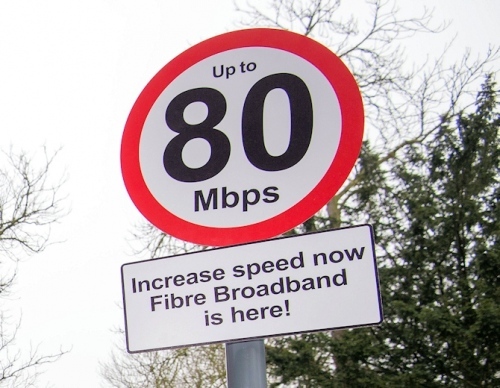 Put another way, local broadband speeds can fluctuate for so many different reasons that no national advert will ever be able to accurately communicate the speeds you can expect. This is also one reason why Ofcom’s separate rule, which requires that customers be given a personal speed estimate during the order process, is so important. We highlighted to the ASA that this could be a problem because business and residential services have different peak-times (e.g. home users peak in the evening, while business traffic is more daytime centric). The ASA clarified that if, for example, and ad was clearly targeted at small businesses then they would “expect the advertiser to hold evidence that a representative peak time measure had been used“, which appears to allow some flexibility for business ISPs to use a different time period. Sadly all of this creates sort of a chicken and the egg style situation for sites like ISPreview.co.uk, which means we have to wait and see how ISPs adapt before being able to fully introduce the changes (no doubt some smaller ISPs will simply ignore the guidelines). We can of course generalise where similar technologies are used but we can’t do that for other independent network platforms, unless they adapt. In the meantime our approach will be to continue listing ‘up to’ speeds and also offer an average download alongside, which will be left blank if the provider has yet to set one. Over time we’d expect to remove the ‘up to’ speeds once the industry has adapted. Separately we’ll be keeping an eye out to see if the new guidance results in more ISPs rejecting consumers who are predicted to receive a slower broadband speed, which could negatively impact their advertised rate. Sky has already given us one possible example of this approach (here). One final point is that we also expect this change to impact “full fibre” (FTTH/P) providers, which may advertise Gigabit capable connections but they can’t always deliver on that full speed at peak times. Speaking of which, the CAP has separately today posted the outcome of their probe into how ISPs advertise using “fibre broadband” terminology, which is such an important issue that it requires its own separate article (here). Do you think advertising average speeds will improve promotions of service performance vs the 10% rule? There is extraordinary room for this to change the behaviour of providers, especially xDSL providers. Rejecting customers that are too far from cabinet/exchange, nudging heavy users towards the door by charging list price. Changing pricing models even and giving up unlimited. Virgin Media can spend a few quid and will be fine. xDSL just cannot do that which is probably the point – to push hybrid technologies towards solutions that are insensitive to distance. Sky are already refuse to supply and ADSL service in some circumstances. Sky are LLU in my exchange and claim their broadband is not available for my number (which the BT DSL checker predicts speeds of 1 to 3.5 Mbps) yet if you query a number closer to the exchange the Sky service is offered. Agree, this change will be bad news for customers that live too far from the exchange or cabinet and may find it impossible to change providers in the future. I can’t see many ISP’s rushing to sign up customers who are going to drag down the ISP’s overall average speed. Worry not BT and its USO only minus the “O” are going to save you and give you 10Mb. The ADSL line is a backup line but I’ll be ditching that soon too and have zero fixed land lines soon at this premises. I gave up hope that BDUK would help us long ago or that the USO would come any time soon so built our own fixed wireless network to solve the problem. Works great. Presumably the “peak-time” requirement will impact Virgin most due to their shared HFC segments used to deliver last mile access to the majority of their residential clients? No not really congestion issues which i supposed you are on about again only affect a minority of users. If you look at thinkbroadband Virgin are already capable of higher median speeds than FTTC services. As Carl also mentioned spending just a few quid they can solve most things. DOCSIS 3 can do quite a bit more than what Virgin currently provide service and speed wise, if anything they can improve their “median” figures further if they so choose. The same can not be said for VDSL/FTTC. This will affect VDSL more, expect to see an upto 76/80Mb profuct now described as around 50Mb (or approx 40% slower than current advertised speeds) and 38/52Mb to be advertise at around 25-30Mb (or approx 30%-40% slower than what is currently advertised). Upload speeds and the typical 10Mb and 20Mb currently advertised will also likely at some point be more like 6Mb and 15Mb respectively. Or as Carl once again said in simple terms this will “push hybrid technologies towards solutions that are insensitive to distance”. Not often i agree with Ofcom, government or ASA decisions but this is one for the better and will hopefully stop confusion to those less savy who order something thinking they will get a certain speed and only end up will about 60% of what they expected.